The easiest way to get started with AWS CodePipeline is to use the Create Pipeline wizard in the CodePipeline console to create a simple pipeline. In this tutorial, you use CodePipeline to deploy code that is maintained in a CodeCommit repository to a single Amazon EC2 instance. You will use CodeDeploy as the deployment service. Many of the actions you add to your pipeline in this procedure involve AWS resources that you need to create before you create the pipeline. AWS resources for your source actions must always be created in the same AWS Region where you create your pipeline. For example, if you create your pipeline in the US East (Ohio) Region, your CodeCommit repository must be in the US East (Ohio) Region. You can add cross-region actions when you create your pipeline. AWS resources for cross-region actions must be in the same AWS Region where you plan to execute the action. For more information about cross-region actions, see Add a Cross-Region Action in CodePipeline. Not what you're looking for? To create a simple pipeline using a versioned Amazon S3 bucket as a code repository, see Tutorial: Create a Simple Pipeline (Amazon S3 Bucket). After you complete this tutorial, you should have enough practice with CodeCommit concepts to use it as a repository in your pipelines. CodePipeline uses Amazon CloudWatch Events to detect changes in your CodeCommit source repository and branch. Using Amazon CloudWatch Events to start your pipeline when changes occur is the default for this source type. When you use the wizard in the console to create a pipeline, the rule is created for you. If you have already completed the Tutorial: Create a Simple Pipeline (Amazon S3 Bucket) tutorial, but have not yet cleaned up its resources, you must create different names for many of the resources you used in that tutorial. For example, instead of MyFirstPipeline, you might name your pipeline MySecondPipeline. To start this tutorial, you create a repository in CodeCommit. Your pipeline gets source code from this repository when it runs. You also create a local repository where you maintain and update code before you push it to the CodeCommit repository. For information about connecting to a local repo you create, see Connect to a CodeCommit Repository. After you complete these two procedures, return to this page and continue to the next step. Do not continue to the third step in the CodeCommit tutorial. You must complete different steps in this tutorial instead. In this step, you download code for a sample application that was created for a CodeDeploy sample walkthrough, and add it to your CodeCommit repository. Unzip the files and push the files to the root of your test repository. For this tutorial, if you created the /tmp/my-demo-repo directory, unzip the files from SampleApp_Linux.zip into the local directory you created in the previous procedure (for example, /tmp/my-demo-repo or c:\temp\my-demo-repo). git commit -m "Added sample application files"
The files you downloaded and added to your local repo have now been added to the master branch in your CodeCommit MyDemoRepo repository and are ready to be included in a pipeline. In this step, you create the Amazon EC2 instance where you deploy a sample application. As part of this process, you install the CodeDeploy agent on the instance. The CodeDeploy agent is a software package that enables an instance to be used in CodeDeploy deployments. This tutorial provides sample steps for creating an Amazon EC2 Linux instance. For sample steps to create an Amazon EC2 Windows instance, see Step 2: Create Amazon EC2 Windows Instances and Install the CodeDeploy Agent in Tutorial: Create a Simple Pipeline (Amazon S3 Bucket). These basic configurations, called Amazon Machine Images (AMIs), serve as templates for your instance. This tutorial can be completed with any of the free tier eligible AMIs. For simplicity, we use the HVM edition of the Amazon Linux AMI. On the Step 2: Choose an Instance Type page, choose the free tier eligible t2.micro type as the hardware configuration for your instance, and then choose Next: Configure Instance Details. In Number of instances, enter 1. In IAM role, choose an IAM role that has been configured for use as an IAM instance profile for use with CodeDeploy. If you do not have an IAM instance profile, choose Create new IAM role and follow the instructions in Create an IAM Instance Profile for Your Amazon EC2 Instances. For the purposes of this tutorial, you can use the following unrestricted policy in your IAM instance profile for CodeDeploy. For pipelines you use in your development workflows, you might create a more restrictive bucket policy. This code installs the CodeDeploy agent on your instance as it is created. If you prefer, you can connect to your Linux instance using SSH and install the CodeDeploy agent manually after the instance is created. Leave the rest of the items on the Step 3: Configure Instance Details page unchanged. Choose Next: Add Storage, leave the Step 4: Add Storage page unchanged, and then choose Next: Add Tags. On the Add Tags page, with Name displayed in the Key box, type MyCodePipelineDemo in the Value box, and then choose Next: Configure Security Group. The Key and Value boxes are case-sensitive. Next to Assign a security group, choose Create a new security group. In the row for SSH, under Source, choose My IP. Choose Add Rule, choose HTTP, and then under Source, choose My IP. If you already have a key pair to use with Amazon EC2 instances, select Choose an existing key pair, and then select your key pair. If you have not created a key pair yet, select Create a new key pair, enter a name for the key pair, and then choose Download Key Pair. This is your only chance to save the private key file. Be sure to download it. Save the private key file in a safe place. You must provide the name of your key pair when you launch an instance. You must provide the corresponding private key each time you connect to the instance. For more information, see Amazon EC2 Key Pairs. Don't select the Proceed without a key pair option. If you launch your instance without a key pair, you can't connect to it if you need to troubleshoot issues with the CodeDeploy agent. Choose View Instances to close the confirmation page and return to the console. It can take a few minutes for the instance to be ready for you to connect to it. Check that your instance has passed its status checks. You can view this information in the Status Checks column. If you want to confirm that the CodeDeploy agent is configured correctly, you can connect to your Linux instance using SSH and then verify the CodeDeploy agent is running. In CodeDeploy, an application is an identifier, in the form of a name, for the code you want to deploy. CodeDeploy uses this name to ensure the correct combination of revision, deployment configuration, and deployment group are referenced during a deployment. You select the name of the CodeDeploy application you create in this step when you create your pipeline later in this tutorial. Open the CodeDeploy console at https://console.aws.amazon.com/codedeploy. If the Applications page does not appear, on the AWS CodeDeploy menu, choose Applications. Leave Custom application selected. In Application name, enter MyDemoApplication. In Compute Platform, choose EC2/On-premises. On the page showing your application, choose Create deployment group. In Deployment group name, enter MyDemoDeploymentGroup. In Service Role, choose a service role that trusts AWS CodeDeploy with, at minimum, the trust and permissions described in Create a Service Role for CodeDeploy. To get the service role ARN, see Get the Service Role ARN (Console). Under Deployment type, choose In-place. Under Environment configuration, choose Amazon EC2 Instances. Choose Name in the Key box, and in the Value box, enter MyCodePipelineDemo. You must choose the same value for the Name key here that you assigned to your Amazon EC2 instance when you created it. If you tagged your instance with something other than MyCodePipelineDemo, be sure to use it here. Under Deployment configuration, choose CodeDeployDefault.OneAtaTime. Under Load Balancer, clear Enable load balancing. Expand the Advanced section. Under Alarms, choose Ignore alarm configuration. You're now ready to create and run your first pipeline. Sign in to the AWS Management Console and open the CodePipeline console at http://console.aws.amazon.com/codesuite/codepipeline/home. 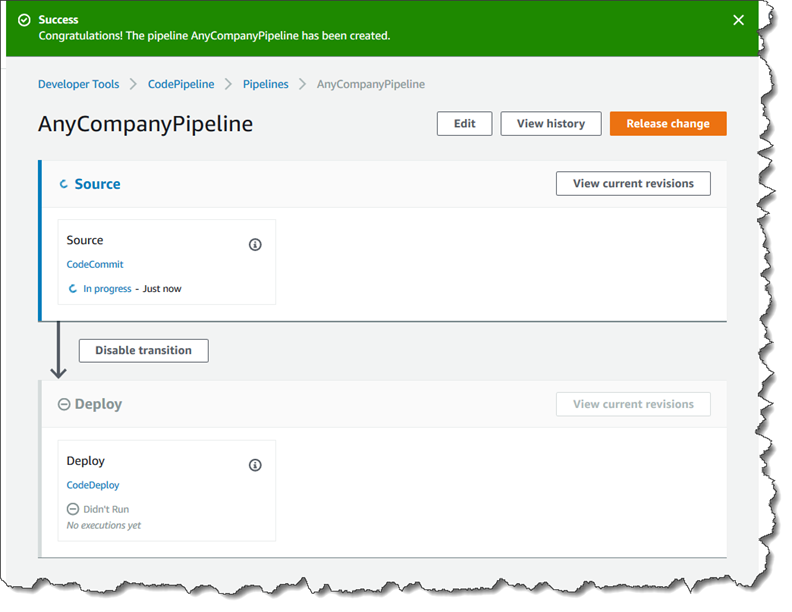 On the Welcome page, Getting started page, or the Pipelines page, choose Create pipeline. In Step 1: Choose pipeline settings, in Pipeline name, enter MyFirstPipeline. If you choose another name for your pipeline, be sure to use it instead of MyFirstPipeline in the remaining steps of this tutorial. After you create a pipeline, you cannot change its name. Pipeline names are subject to some limitations. For more information, see Limits in AWS CodePipeline. Choose New service role to allow CodePipeline to create a new service role in IAM. In Role name, the role and policy name both default to this format: AWSCodePipelineServiceRole-region-pipeline_name. For example, this is the service role created for this tutorial: AWSCodePipelineServiceRole-eu-west-2-MyFirstPipeline. Choose Existing service role to use a service role already created in IAM. In Role name, choose your service role from the list. Depending on when your service role was created, you might need to update its permissions to support additional AWS services. For information, see Add Permissions for Other AWS Services. Choose Default location. This uses the default artifact store, such as the Amazon S3 artifact bucket designated as the default, for your pipeline in the region you have selected for your pipeline. Choose Custom location if you already have an artifact store, such as an Amazon S3 artifact bucket, in the same region as your pipeline. This is not the source bucket for your source code. This is the artifact store for your pipeline. A separate artifact store, such as an Amazon S3 bucket, is required for each pipeline. When you create or edit a pipeline, you must have an artifact bucket in the pipeline Region, and then you must have one artifact bucket per AWS Region where you are running an action. For more information, see A Quick Look at Input and Output Artifacts and CodePipeline Pipeline Structure Reference. In Step 2: Add source stage, in Source provider, choose AWS CodeCommit. In Repository name, choose the name of the CodeCommit repository you created in Step 1: Create a CodeCommit Repository and Local Repo. In Branch name, choose the name of the branch that contains your latest code update. Unless you created a different branch on your own, only master is available. After you select the repository name and branch, a message is displayed showing the Amazon CloudWatch Events rule to be created for this pipeline. Under Change detection options, leave the defaults. This allows CodePipeline to use Amazon CloudWatch Events to detect changes in your source repository. In Step 3: Add build stage, choose Skip build stage, and then accept the warning message by choosing Skip again. Choose Next. In this tutorial, you are deploying code that requires no build service. In Step 4: Add deploy stage, in Deploy provider, choose AWS CodeDeploy. The Region field defaults to the same AWS Region as your pipeline. In Application name, enter MyDemoApplication, or choose the Refresh button, and then choose the application name from the list. In Deployment group, enter MyDemoDeploymentGroup, or choose it from the list, and then choose Next step. The name "Deploy" is the name given by default to the stage created in the Step 4: Deploy step, just as "Source" is the name given to the first stage of the pipeline. In Step 5: Review, review the information, and then choose Create pipeline. The pipeline starts to run. You can view progress and success and failure messages as the CodePipeline sample deploys the webpage to the Amazon EC2 instance in the CodeDeploy deployment. A source stage (Source) that detects changes in the sample application stored in the CodeCommit repository and pulls those changes into the pipeline. A deployment stage (Deploy) that deploys those changes to the Amazon EC2 instance using CodeDeploy. Next, you verify the results. View the initial progress of the pipeline. The status of each stage changes from No executions yet to In Progress, and then to either Succeeded or Failed. The pipeline should complete the first run within a few minutes. After Succeeded is displayed for the pipeline status, in the status area for the Staging stage, choose Details. This opens the CodeDeploy console. Choose your application in the list. On the Deployment group tab, under Deployment lifecycle events, choose the instance ID. This opens the EC2 console. On the Description tab, in Public DNS, copy the address, and then paste it into the address bar of your web browser. This is the sample application you downloaded and pushed to your CodeCommit repository. For more information about stages, actions, and how pipelines work, see CodePipeline Concepts. In this step, you make changes to the HTML file that is part of the sample CodeDeploy application you deployed to your Amazon EC2 instance. When your pipeline runs again later in this tutorial, the changes you make are visible at the http://PublicDNS URLs. Revise the contents of the index.html file to change the background color and some of the text on the webpage, and then save the file. git commit -am "Updated sample application files"
Your pipeline is configured to run whenever code changes are made to your CodeCommit repository. View the initial progress of the pipeline. The status of each stage changes from No executions yet to In Progress, and then to either Succeeded or Failed. The pipeline should complete within a few minutes. After Succeeded is displayed for the action status, in the status area for the Staging stage, choose Details. This opens the CodeDeploy console. On the Deployment group tab, under Deployment lifecycle events, choose the instance ID. This opens the EC2 console. If you want to gain more experience working with stages before you end the tutorial, you can follow two additional procedures in the Tutorial: Create a Simple Pipeline (Amazon S3 Bucket). In step 4 of the second procedure, instead of uploading your sample to an Amazon S3 bucket again, make a change to the sample app in your local repo and push it to your CodeCommit repository. You can use some of the resources you created in this tutorial for the next tutorial, Tutorial: Create a Four-Stage Pipeline. For example, you can reuse the CodeDeploy application and deployment. However, after you complete this and any other tutorials, you should delete the pipeline and the resources it uses, so that you are not charged for the continued use of those resources. First, delete the pipeline, then the CodeDeploy application and its associated Amazon EC2 instance, and finally, the CodeCommit repository. To clean up your CodePipeline resources, follow the instructions in Delete a Pipeline in AWS CodePipeline. To clean up your CodeDeploy resources, follow the instructions in Clean Up Deployment Walkthrough Resources. To delete the CodeCommit repository, follow the instructions in Delete a CodeCommit Repository.